Apple Mary was strictly a Depression-era comic strip. Its major theme was economic hardship, and its most prominent image was a proud, independent person forced to make ends meet by selling apples from a pushcart. its media environment, employing characterizations and motifs from soap operas, which had become a very popular genre on the radio. Tho The Gumps and Gasoline Alley had pioneered the form in comics, it was Apple Mary that brought it to the depths of pathos employed by the contemporary radio soaps. Just to set the tone, the main focus of Mary's life was Dennie, her crippled grandson. Cartoonist Martha Orr, who has no other credits in comics, created Apple Mary, probably basing her on the protagonist of Frank Capra's 1933 film, Lady for a Day. Orr, whose uncle, Carey Orr, was an editorial cartoonist for The Chicago Tribune, apparently met little difficulty in selling her strip. Publishers Syndicate (Dan Dunn, Tales from the Great Book) began distributing it on October 29, 1934, and it quickly began to rise in circulation. Orr continued to write and draw her strip until 1939, when she left Mary's family behind to tend to her own. At that point — accounts differ. 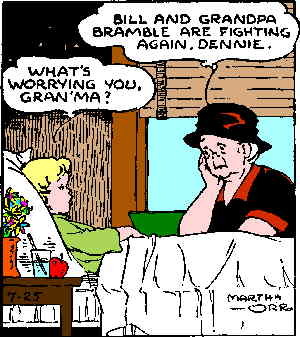 It's generally thought that under a new writer (Allen Saunders, whose credits include Kerry Drake and Steve Roper) and artist (Dale Connor, formerly Orr's assistant), it gradually metamorphosed into Mary Worth. But King Features Syndicate, which currently distributes the latter, says no, Apple Mary ended; the two are separate strips. Whatever the case may be, as the Great Depression lifted, Apple Mary was left behind. There is little to be seen of her in the Mary Worth of today. Text ©2001-06 Donald D. Markstein. Art © Publishers Syndicate.